New favorite dinner! It has meat. It has greens. 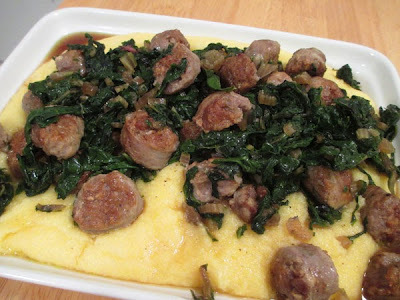 And it has polenta! It is one of our new comfort foods. The recipe is from RealSimple.com. I loved the flavors. The only change to the recipe is that I used the stems from the chard. I sliced them very thin and sauteed them first before adding the leaves. This recipe will be put in the regular rotation. Add the sausage and cook, turning occasionally, until cooked through, 10 to 12 minutes. Transfer to a cutting board and let rest 5 minutes before slicing. Cook the polenta according to the package directions. Meanwhile, wipe out the skillet and heat the remaining tablespoon of oil over medium heat. Add the garlic and cook, stirring for 1 minute. Add the Swiss chard, 1/2 teaspoon salt, and 1/4 teaspoon pepper and cook, tossing, until wilted, 3 to 4 minutes. Fold in the sliced sausage. Serve the sausage and chard mixture over the polenta.